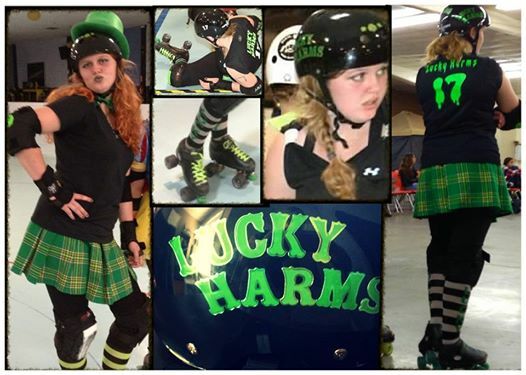 An SVRG 2.0 skater since October 2013, Lucky Harms is SVRG’s March Junior Derby (Jerby) of the Month. Lucky is making great progress as a Jerby skater. Having only skated for a few months, Lucky Harms was awarded Rookie of the Year for 2013. You won’t be able to catch her as a Jerby girl for much longer as this lucky lady will soon be turning 18 and moving on up to one of SVRG’s adult teams. Congratulations Lucky, keep up the hard work! My derby name is Lucky Harms and my number is 17. Really, the name is just what I loved most after months of indecision. Part of the reason I chose it is that I love the theme that I can incorporate into my skate wear. How long have your been skating with SVRG 2.0? I have been skating with SVRG 2.0 since October 2013, and loving it ever since! Did you have any skating experience before joining SVRG 2.0? 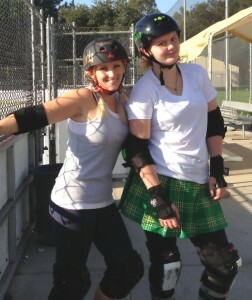 Before joining SVRG 2.0, I had never skated on quads, and had hardly even heard of derby. I have, however, skated in hockey skates for as long as I can remember. How did you decide to become a roller derby girl? I definitely feel most comfortable as a blocker, and I love holding the inside line and covering lane three. How do you spend your time when you aren't on the track? When I'm not skating, I love nothing more than dirt biking. 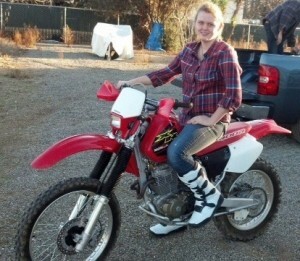 I have a Honda XR 400, and I spend every possible weekend riding in Hollister. In 2014, I hope to improve my skills as a skater by increasing my track awareness and becoming a stronger voice to my team mates in bouts. Other than that, I'm just excited to be graduating high school in May. My worst habit is being single-minded. Sometimes I focus so much on one aspect of the game that I don't see the jammer passing me, or an opposing blocker bettering her position. What positive aspects has derby brought into your life? Roller derby has given me confidence and self-awareness, but most of all, it's given me a great team that inspires me every time we skate, and several amazing coaches who I aspire to be like every day, on and off the track.